Spine anatomy 101. The vertebral column is also known as the backbone or spine. It is a column of vertebrae situated in the dorsal aspect of the torso. It houses the spinal cord in its spinal canal. Viewed laterally the vertebral column anatomy presents several curves, which correspond to the different regions of the column. The cervical curve with convex forward. It begins at the apex of the odontoid (tooth-like) process. Then it ends at the middle of the second thoracic vertebra. The top bone should line up with the bottom. The thoracic curve is a concave forward. It begins at the middle of the second bone. And it ends at the middle of the twelfth thoracic vertebra. Its most prominent point behind corresponds to the spinous process of the seventh thoracic vertebra. So this curve is known in anatomy as a kyphotic curve. The lumbar curve anatomy is more pronounced in the female than in the male. It begins at the middle of the last thoracic vertebra. So it ends at the sacrovertebral angle. It is convex anteriorly. The convexity of the lower three vertebrae being much greater than that of the upper two. So this curve is a lordotic curve. The pelvic curve begins at the sacrovertebral articulation. It ends at the point of the coccyx. The thoracic and pelvic curves are termedprimary curves. Because they alone are present during fetal life. So the vertebral column is C-shaped. That begins in the early embryo. And the cervical and lumbar curvatures are not yet present in a newborn infant. The cervical and lumbar curves are compensatory or secondary. The former when the child is able to hold up its head (at three or four months), and to sit upright (at nine months). The latter at twelve or eighteen months, when the child begins to walk. The body’s ability to develop is truly amazing. We can also learn a lot by observing this process. 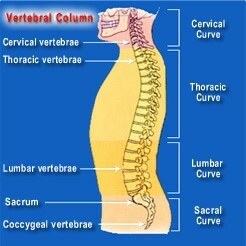 The thoracic portion of the vertebral column also has a slight lateral curvature. The convexity of the thoracic spine leans toward the right. Most people use their right arm in preference to their left. This curvature is regarded by others as being produced by the aortic arch and upper part of the descending thoracic aorta. So a view which is supported by the fact that in cases of situs inversus where the viscera are transposed and the aorta is on the right side, the convexity of the curve is directed to the left side. So different regions (curvatures) of the vertebral column and names of individual vertebrae. The vertebral column anatomy – seen from the side. Individual vertebrae named according to region and position. So from superior to inferior. Here are the names of the individual bones. C1 – “atlas”. So it supports the head. C2 – “axis”. It Possesses bifid spinous processes, which is absent in C7. Distinguished by the presence of costal facets for the articulation of the heads of ribs. The Body is intermediate in size between the cervical and lumbar vertebrae. These bones have a large body. Does not have costal facets nor transverse process foramina. Coccygeal – 3-5 vertebrae (Co1-Co5). You may have more questions. Hopefully this answered some of them. So give us a call if you’d like to discuss anything further. 215-343-3223.